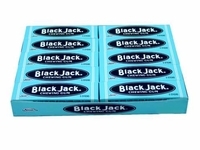 Black Jack Gum is back. The original licorice flavored chewing gum. This is a favorite nostalgic chewing gum from the late 1800's and the first ever flavored gum to be made in sticks. Don't let this little stick fool you. It has a big and bold flavor that lasts a good long time. If you love black licorice, you'll love black jack. We also have all your favorite licorice candies good and plenty , sen sen and old fashioned licorice drops.